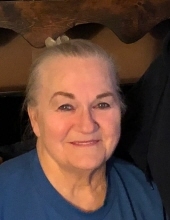 Earlene O. Cole of Oak Ridge, Tennessee passed away peacefully in her home, surrounded by family and friends, on Saturday, January 19, 2019. Earlene worked for many years for Bechtel Inc. in the accounting department. She was a member of First Free Will Baptist Church in Oak Ridge, where she participated in many of the church activities. She enjoyed reading her Bible, working with crafts, collecting unique rocks, and angel figurines. Born the 15th of June 1944 in Seymour, Tennessee, she was the daughter of Earl Odell and Iva Lucille England Phillips, both of which proceed her in death. Also preceding her in death were her first husband John C. Morgan, Sr. and her second husband James H. Cole, Sr., and mother-in-law Cora Cole. as well as their extended families. You are all invited to a Celebration of Life reception scheduled for 6 PM on Wednesday, January 23, 2019 at First Free Will Baptist Church, 162 N. Jefferson Circle, Oak Ridge. To send flowers or a remembrance gift to the family of Earlene O. Cole, please visit our Tribute Store. "Email Address" would like to share the life celebration of Earlene O. Cole. Click on the "link" to go to share a favorite memory or leave a condolence message for the family.